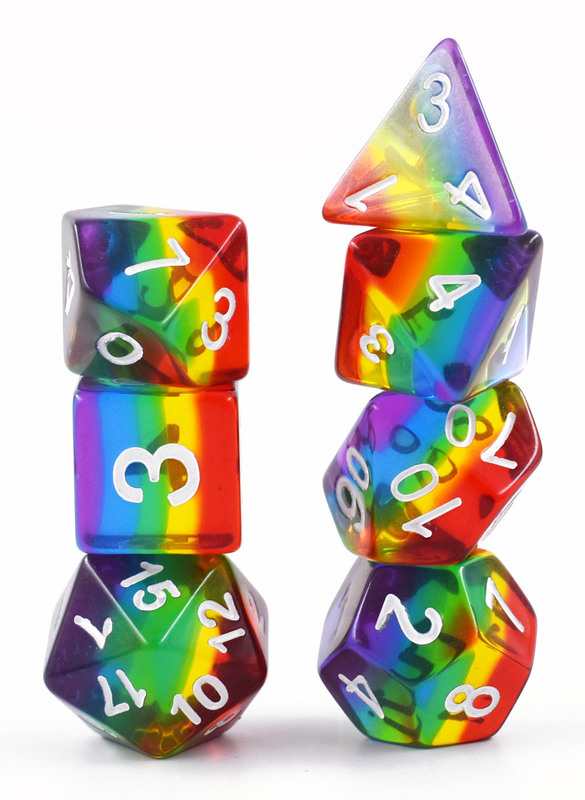 RESTOCKED - Our amazing Vibrant Rainbow Gem dice poly sets (also known a Pride Dice) are back in stock after a long wait. Grab them now, before they run out again! 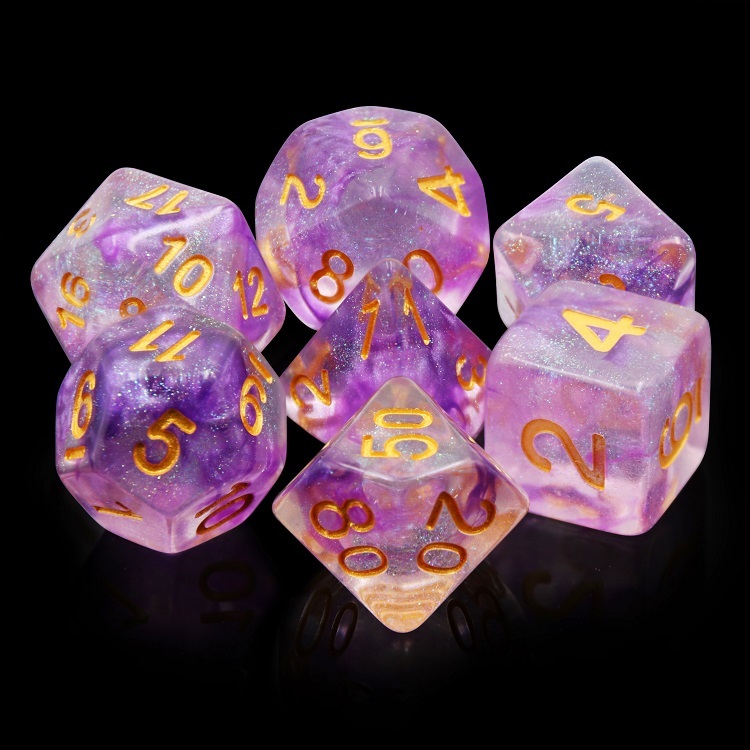 These dice have a beautiful bright gem colour and are truely beautiful. Restocked - Some GF9 Spell Decks restocked. We have new stock of Arcane Decks, Magic Items Cards and the new style Paladin Spell Decks. We've also got a few Tarokka (tarroka) decks in stock, as well as good stock levels of all the other spell decks. 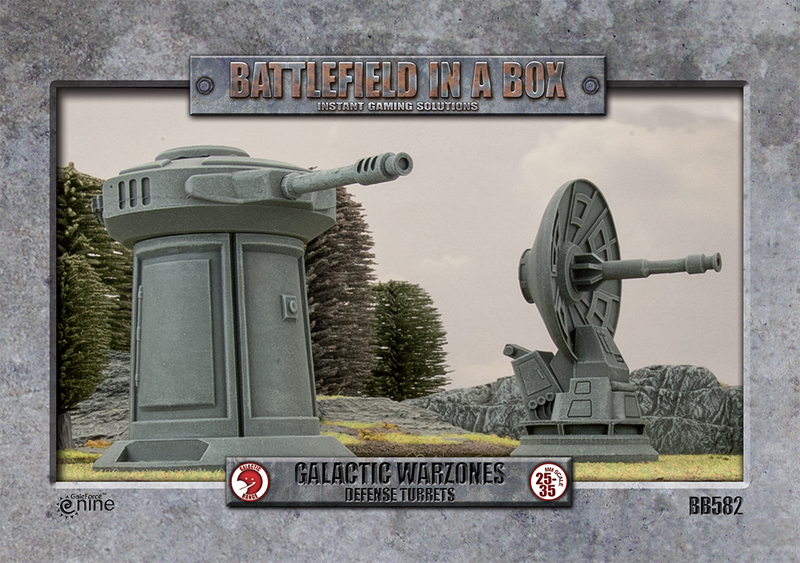 For all you Star Wars Legion fans, we've got good stocks of terrain sets from Batlefront Miniatures, including Desert Buildings, Desert Walls, Desert Towers all suitable for Tatooine style settings, along with Power Gererators, Command Objectives and Laser Turrets that can be used in many Star Wars Legion settings. 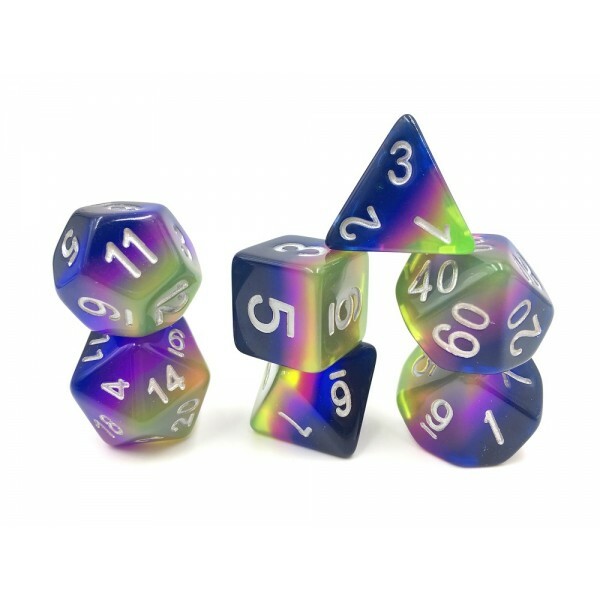 Brand new Iridescent Poly Dice from HD-Dice. Three colours currently available, more to follow. Also in the news... Restocks of Jade Green, Galaxy Red and Green, Pearl Red, Blue and Lake Blue, Elemental Fire Storm and Pink Gold, new Aurora colours and new Storm colours. 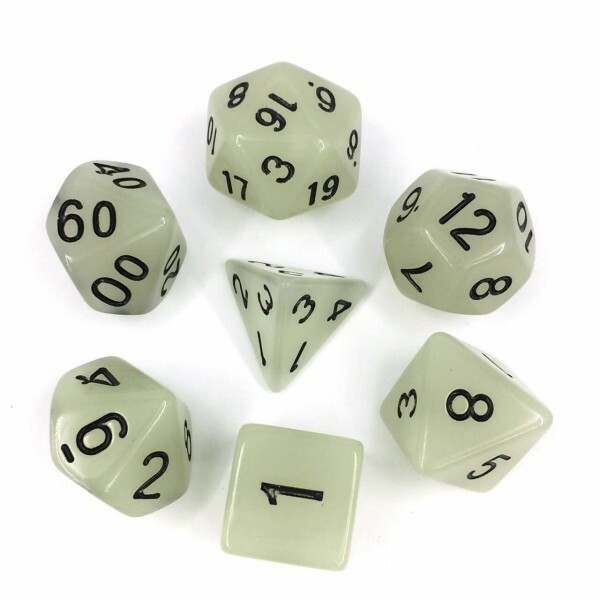 HUGE restock of 16mm spot dice, including the long awaited WHITE, GREEN and YELLOW, plus d10 opaque restocks in several colours. More due next week too. Brand new - direct from Kickstarter, the Upstart Range of Poly Dice from Legendary Pants. A range of standard sized poly dice inspired by 80's computer displays, featuring a retro font that has a cool netrunner feel. Limited numbers in a range of colours. 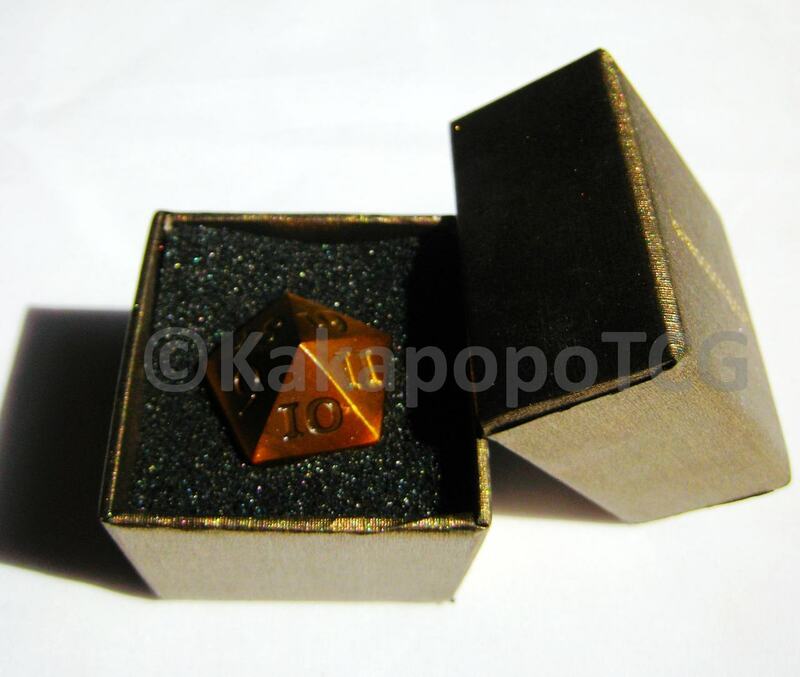 Brand new - Oversized Metal D20 and D30 dice,in 'standard' and 'spin down' style. 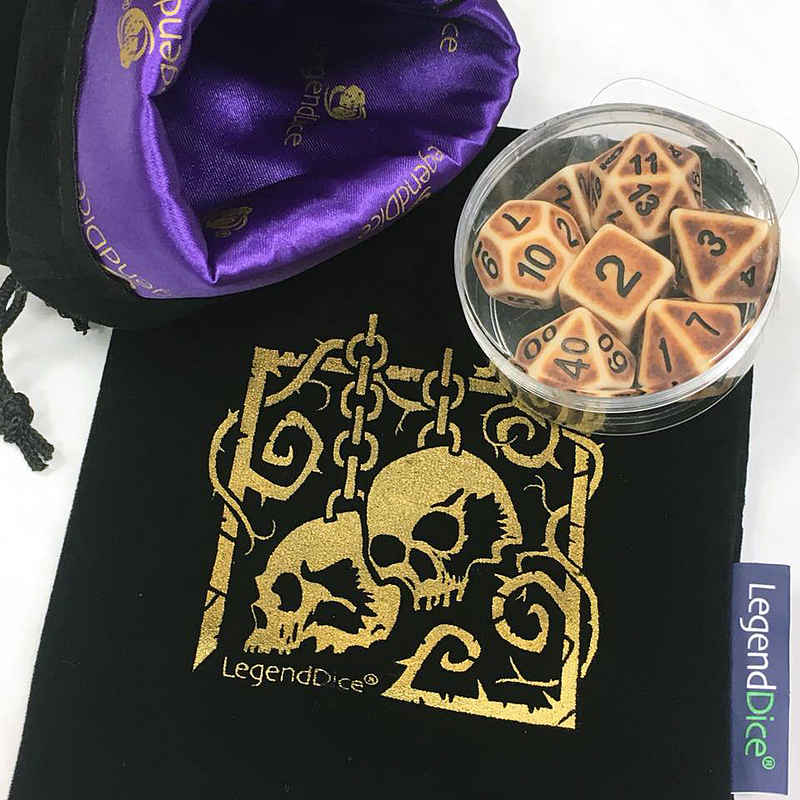 THese awesome super heavyweight cast dice are some of the best we've seen, with great finish, unique font and even a cool presentation box supplied as standard. Direct from KakapopoTTC and ready for shipping NOW! Skull Dice Bags - new re-vamped dice bags with our cool double Skull logo. A black bag with logo in either Gold or Silver, with a vibrant purple lining. Made under license from LegendDice limited. These revamps have got a much better and more durable print quality - the last ones were not as durable as we'd hoped. 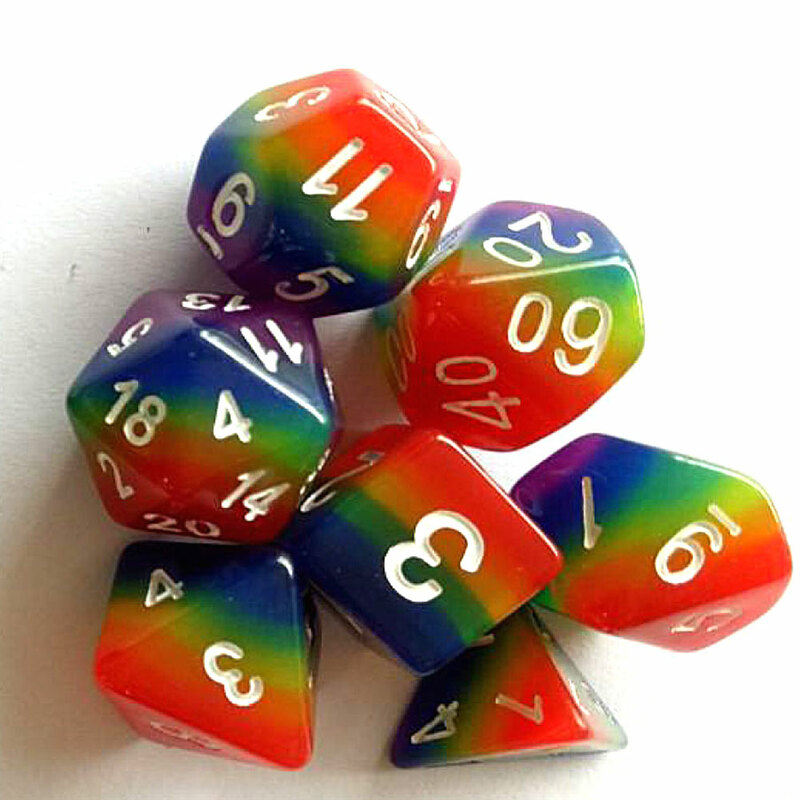 NEW lines in HD Dice Layered Poly Dice - 7 dice RPG sets in a range of cool rainbow finishes. Latest lines are Unicorn and Lagoon. We've also had restocks of JADE Purple, JADE Blue and JADE White, along with some other favourites too. If you can't get these dice in your local games shop, tell them to contact us for trade pricing! Thanks to everyone who has reviewed our service. When you order, we send you a request to review us via Trustpilot, and we'd really appreciate your views on our service - you can leave reviews on TrustPilot for the world to see! 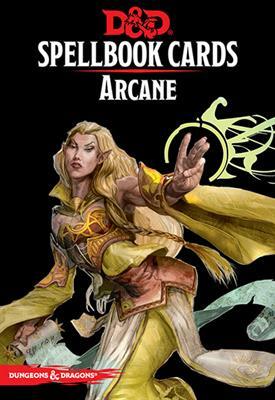 D&D Spell Cards - we now stock Gale Force 9 D&D spell card decks. Limited stock so grab them fast. 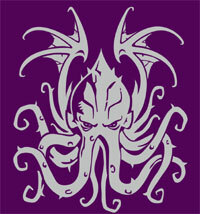 We will add more card decks as they are released - monster decks are slated for later this year. Need gaming terrain? 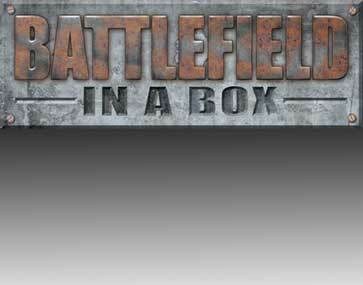 We are now stocking Battlefield in a Box from Battlefront games - these are highly detailed pre-painted scenery packs suitable for a vriety of games. Some are generic, some are designed for WWII, others for Modern Day (WWIII) - teh new range is a sci-fi set that could quite easily be Tatooine, with Hoth like stuff due a bit later too. 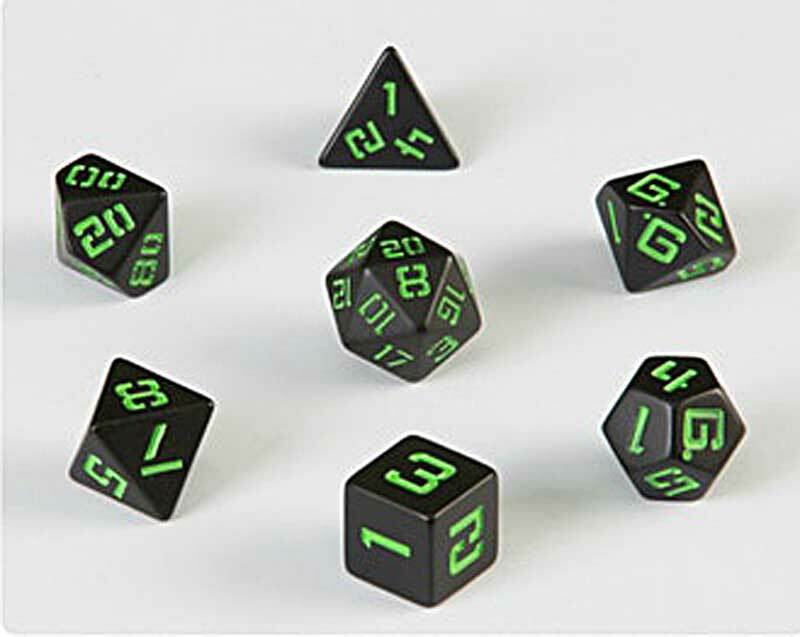 GLOW IN THE DARK poly sets are finally here - we've a couple of glow dice sets, along with a large number of poly dice restocks this week including Elementals, Galaxy, Aurora and loads of Pearl Poly Sets. Notable new items are Bronze 22mm counters to go with the Gold and Silver counters to give you a 'top 3' set of metalic colours. A few ned Elemental and Pearl sets to finish off the month. We've got a green theme going on! 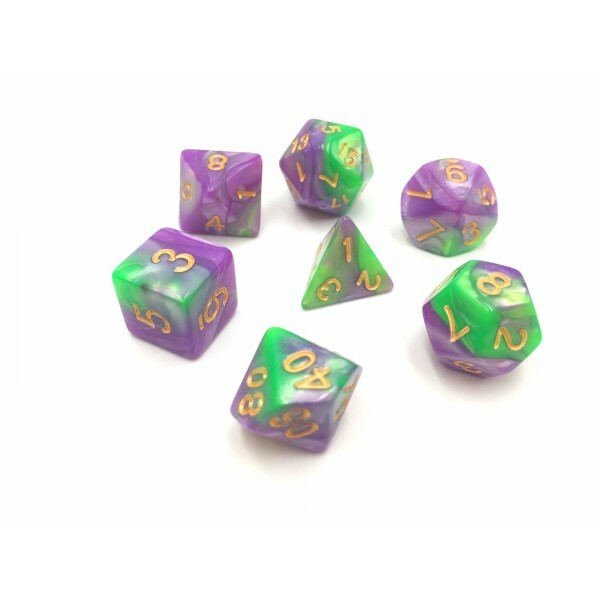 New Rose-Green, Purple-Green and Yellow-Green blended Elementals, and a lustrous Pearl Green with purple numbers as well. 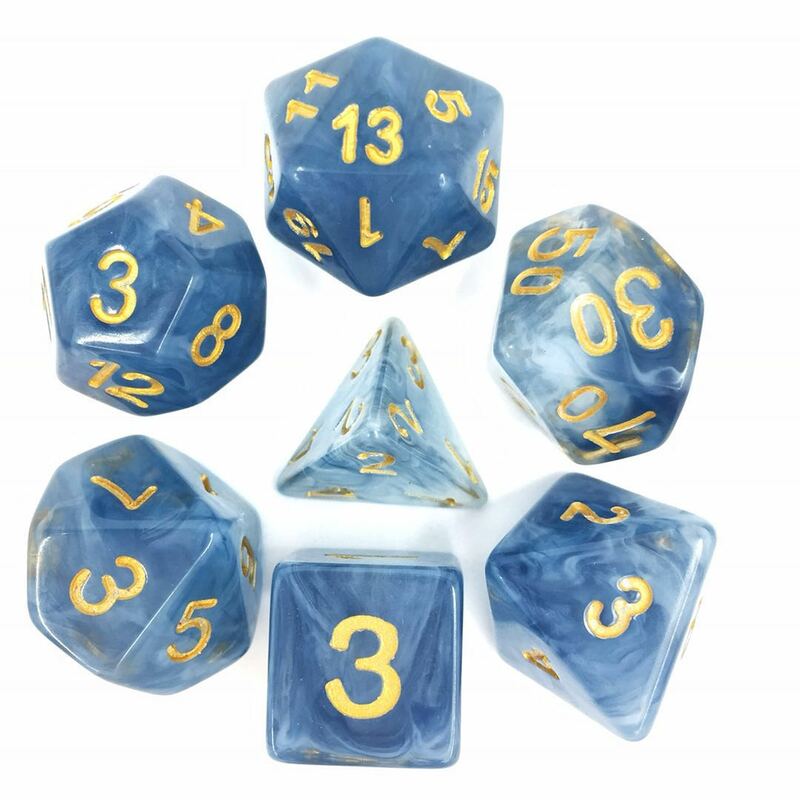 We are moving our warehouse this month - triple to space for dice!! To celebrate our continued success (thanks! your custom is appreciated) we're offering a massive 25% off our already low prices. 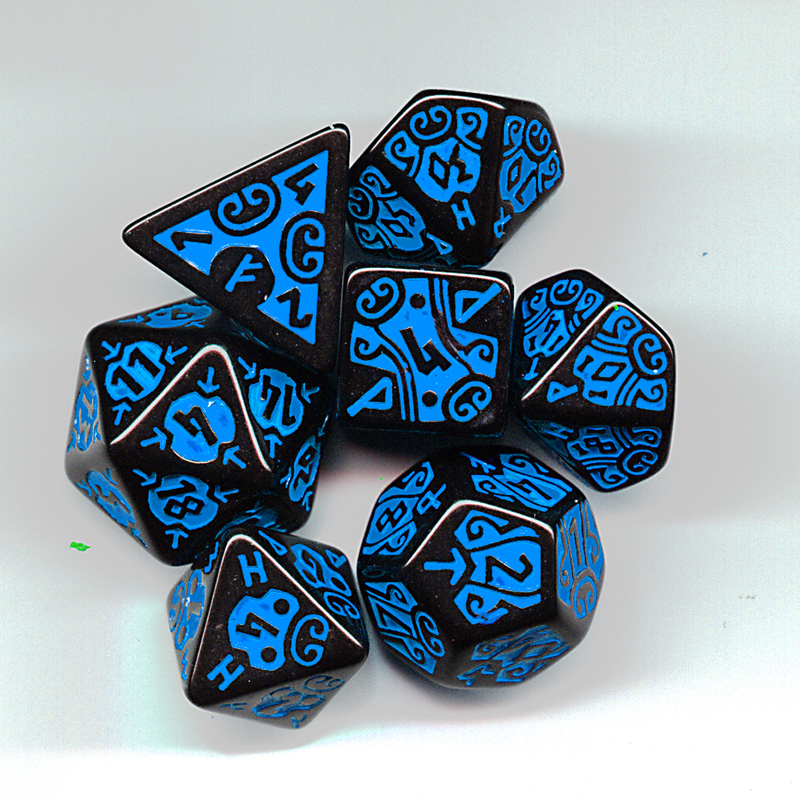 Great Dice, Even Better Price! Just roll for glory! D30, D16 and D3 dice in stock now! no pictures yet. Available individually in a range of colours. Good pricing too. Loads available, so take a look at what we have and full up your Blood Bowl dice bag. We took a trip to a dice manufacturer the other week, and were allowed to wanderround and look at vast stocks of dice. 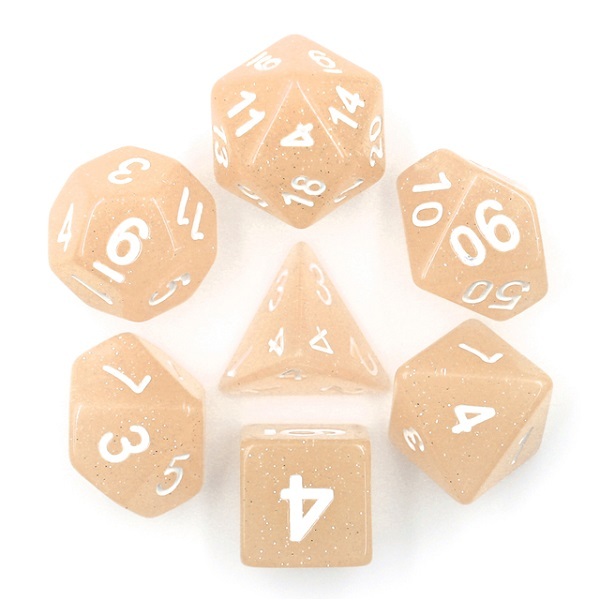 Guess what... We found some more MAGMA poly dice in a variety of colours and dice-sides. This style is no longer made, and these are the last they had, and they didn't even know they had any left!! Grab them now, in packs of 25, as you will find them really hard to come by. If you think you've spotted a pricing error, let us know! We've changed the data feed to the site, and a few items were wrongly priced - we think we've got them all sorted now, but if you think a price is wrong, just let us know! 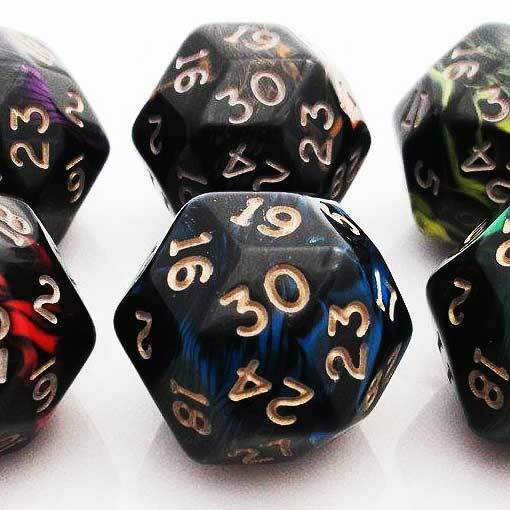 We've added many new poly sets from HD Dice in China - these dice are very good and compare well to Chessex gemini's. 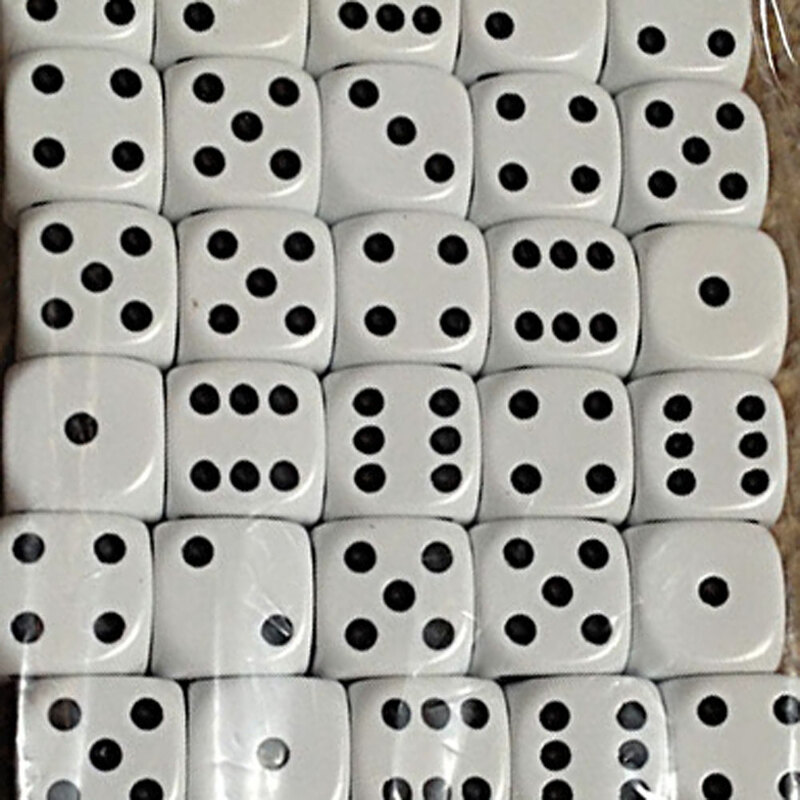 Restocks of Pearl 12mm spot dice, and price reductions too. 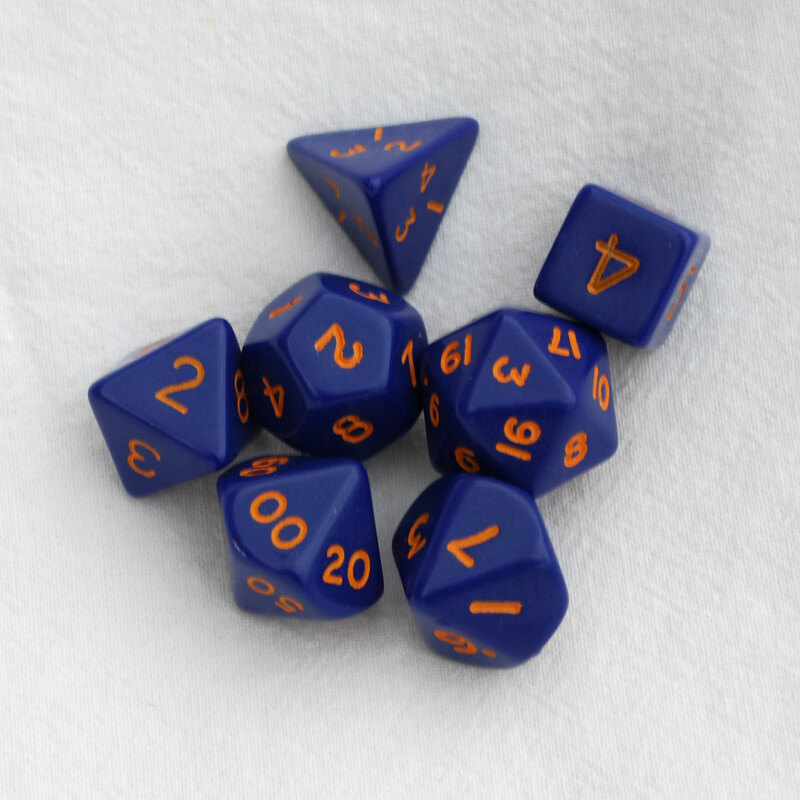 We have also relisted our 12, 14 and 16mm dice. 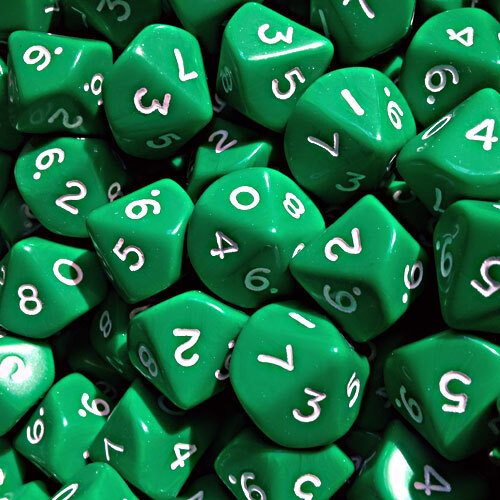 We are no longer selling any individual dice - they now come in packs of 25. We are now selling 15mm counters as well as 22mm counters. Great for tiddlywinks! The Dice Place is now run by Solis Infotech Limited. 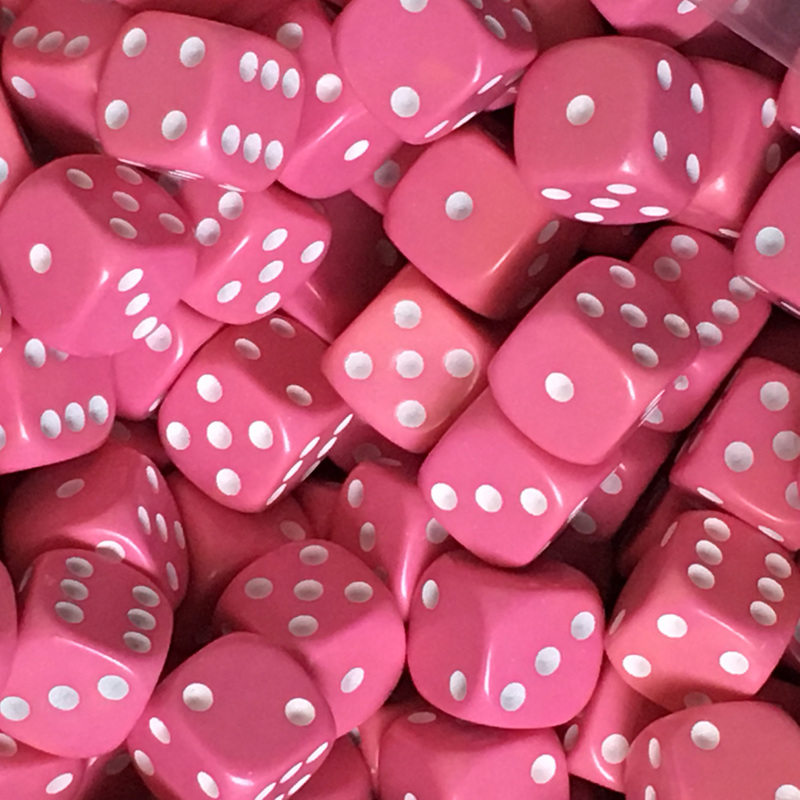 NEW colours and restocks in 16mm opaque spot dice this week - lots of nice new bright colours and standard colours with different spot colour - Red with Gold, Black with Gold, Black with Pink, Bright Blue, Bright Pink and lots more too! 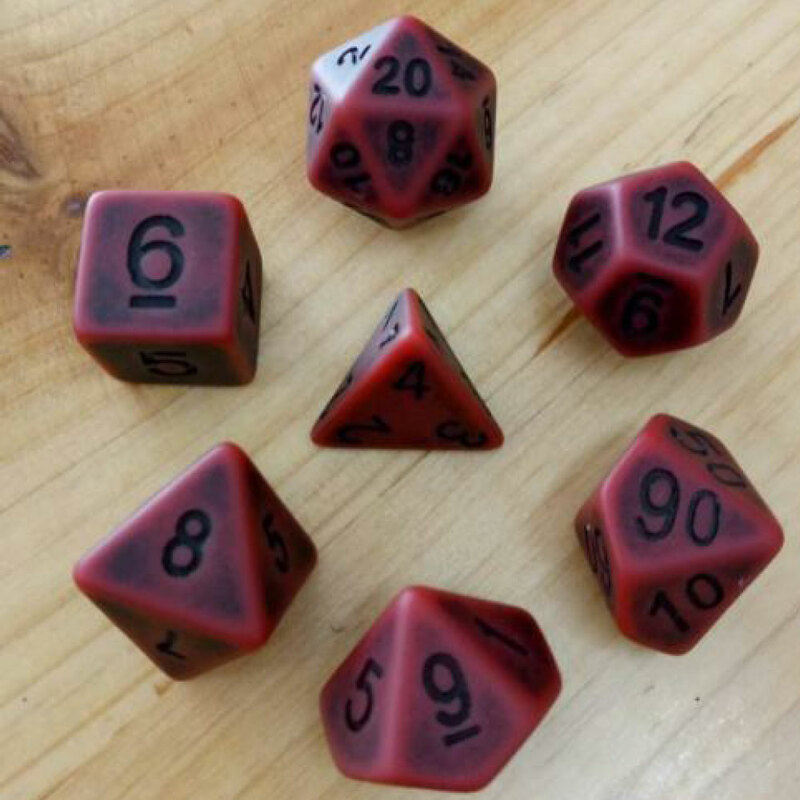 Restocked this week, various colours of opaque spot dice in 12mm and 16mm Black 12mm opaque a notable restock. Our 12mm dice are UK made. They have rounded corners for a good roll, and most have high contrast pips - i.e. white spots on dark colours, and black spots on light colours. There are a few exceptions, please be aware when ordering. 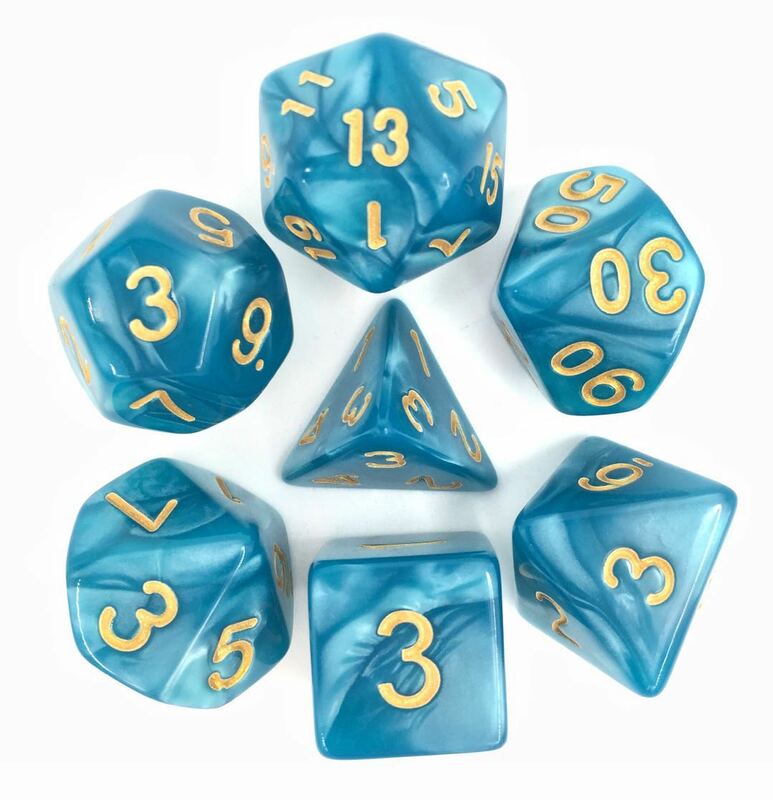 NEW pearl Dice colours including Lake Blue (pictured here) and a beautiful light green have arrived. 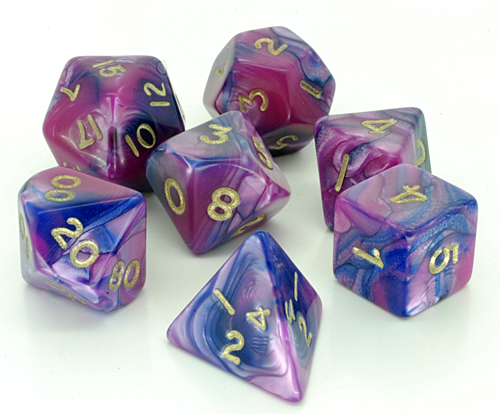 We've also taken restocks of pearl blend dice including two new purple and blue variations which are pretty spectacular. 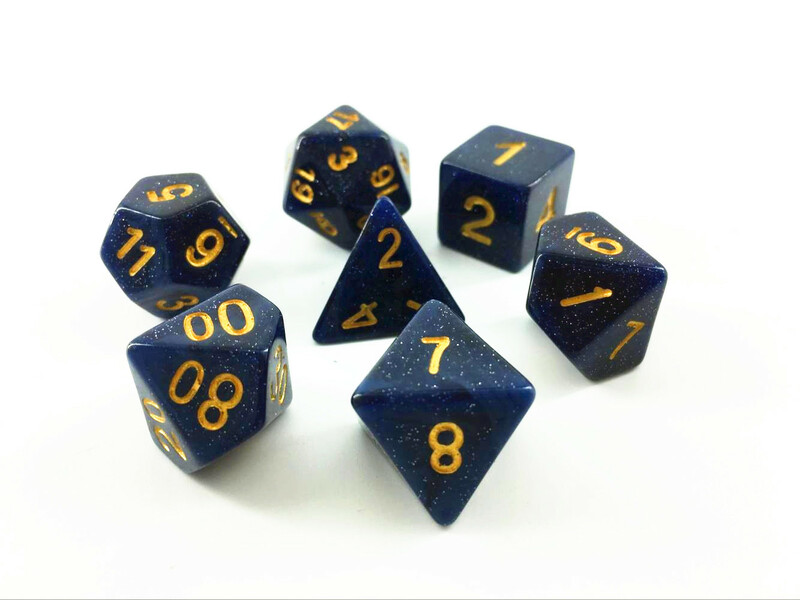 Restocked Today - Galaxy Universe Blue with Gold - long overdue restock of this best selling set, along with restocks of the other colours and a couple of new 'Galaxy' dice to add to the range. THe latest restocks are a little brifhter than the original sets which were very dark and hard to tell apart from each other. 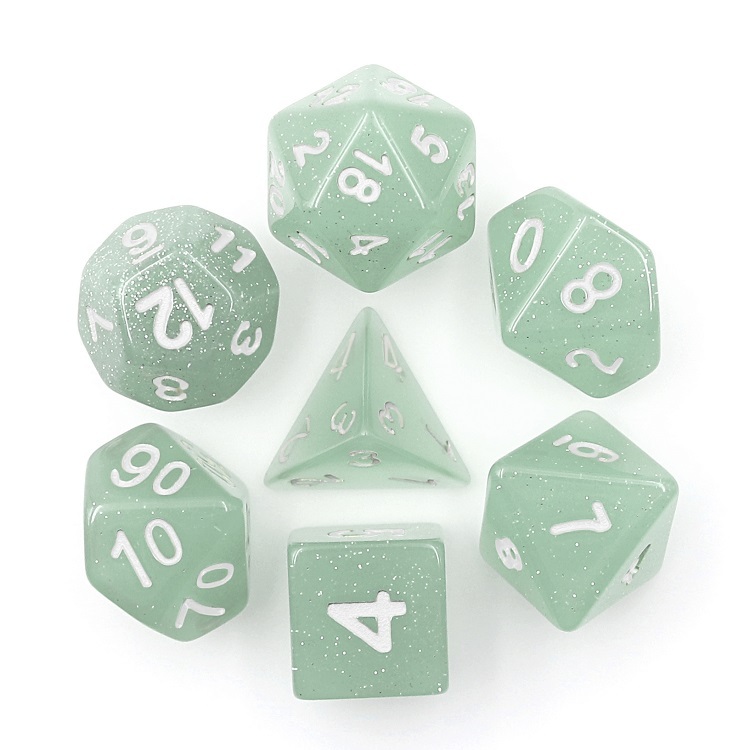 NEW colours in the Jade effect poly dice range now in stock, along with restocks of the Black Jade which prooved very popular. Green Jade still waiting for restocks, but other colours now back and ready to ship. Restocked Today - Viking Dice poly sets AND some D6 individuals. As far as we know, these are the LAST of these dice available to retailers, so they are going to become quite hard to find, pretty soon. Grab them while you still can. LOADS of new styles for you this month, just in time for Chrismas! 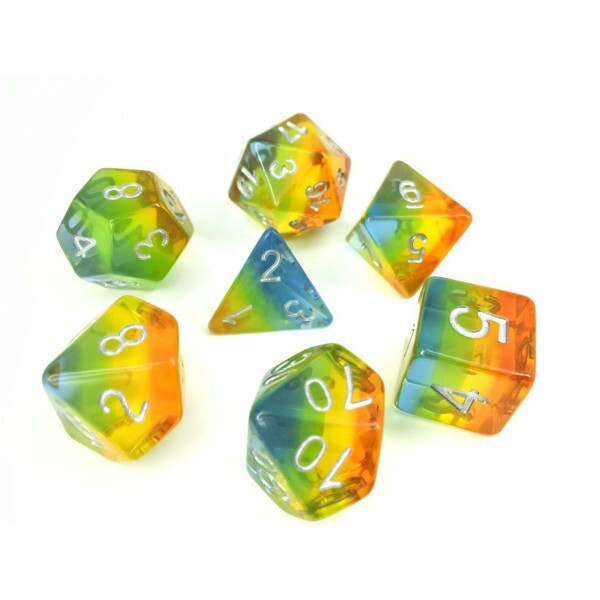 Choose from new Aurora Gem Rainbows (shown), New Elementals and lighter Galaxy dice sets. All available in time for Christmas. Shipping until 21st Dec. WHy not add a dice gab for that extra special gift. 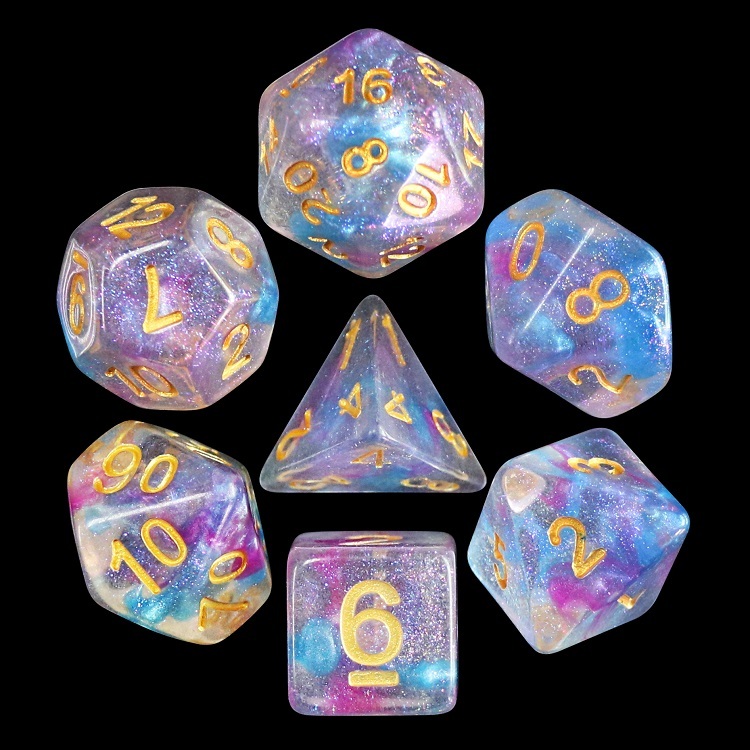 New Aurora and Galaxy Dice in stock now. 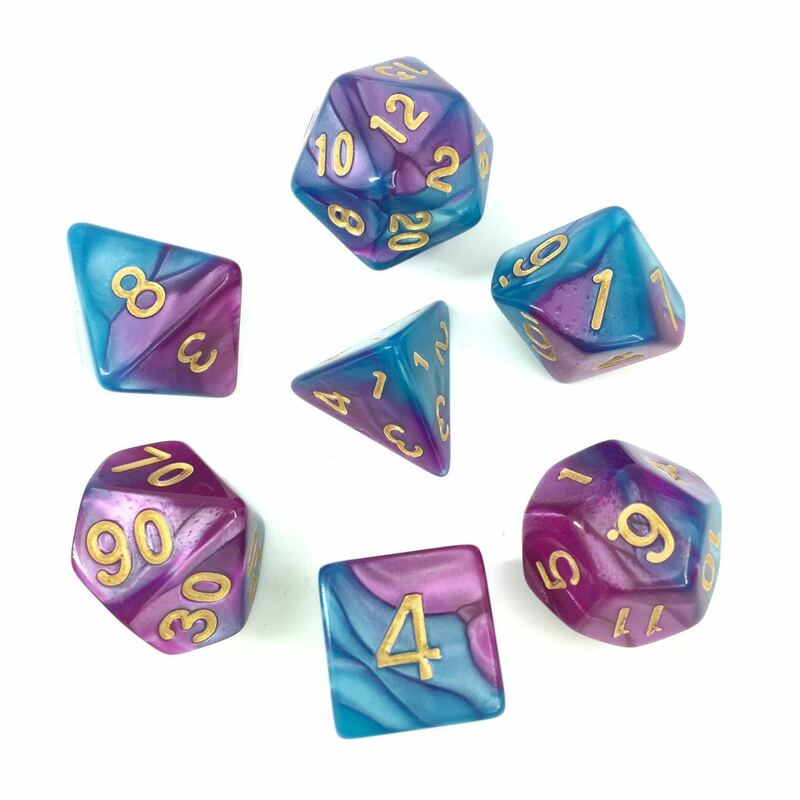 The Auroras are Rainbow Gem dice poly sets with a beautiful ethereal finish. These dice are truely fantastic. The Galaxy Glitter Dice are a very dark gem dice infused with glitter giving a starry galaxy finish. As of today (3rd July 2017) we're on a new faster web server with better connectivity. You may find a few problems with the site in the first 72 hours as the web catches up with our new name servers and IP address. Any issues ordering that can't wait, get in touch and we'll sort it out for you. 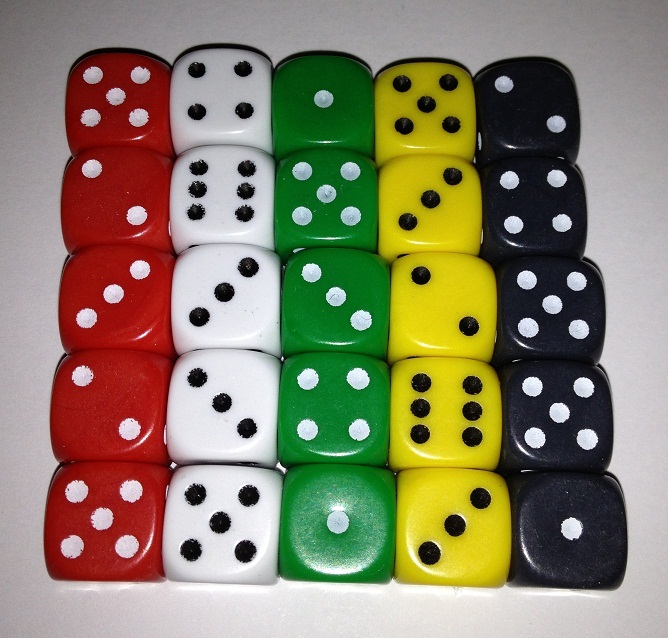 Restocks of standard spot dice in a variety of colours and sizes. 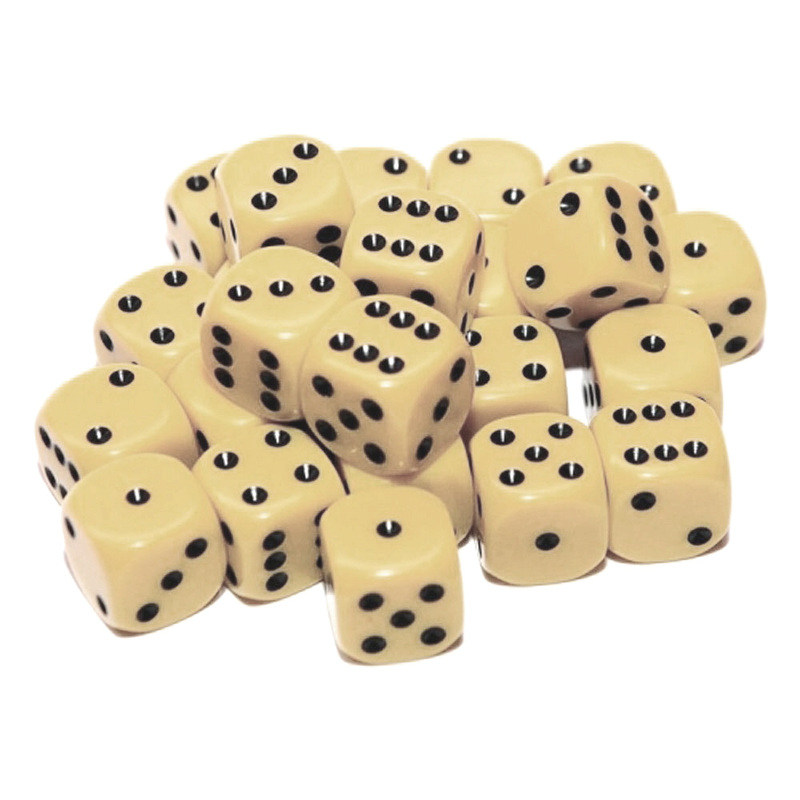 Stcok up on these great value dice now. You can never have too many dice. If the kids lose them, the dog eats them, they just 'dont roll right' then you need a new set! 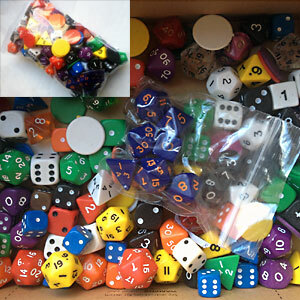 We've added a new 'Bulk Dice Refill' pack - 100+ random dice for £6.00!! 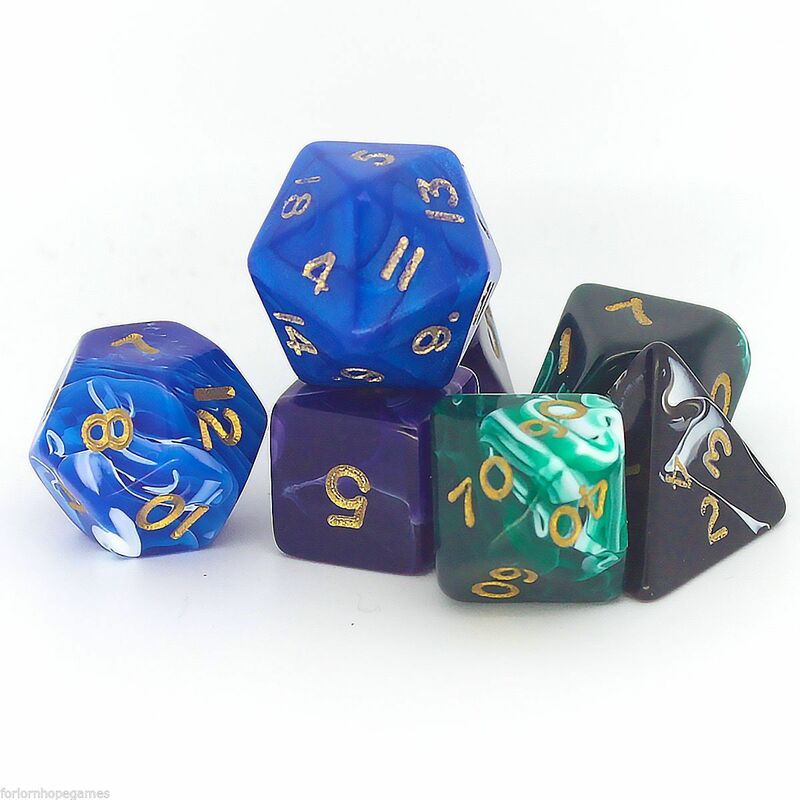 What a deal - similar to the Chessex pound o dice, but standard types and colours, not chessex ones. Find them on the 'Cheap Bulk Dice' page. 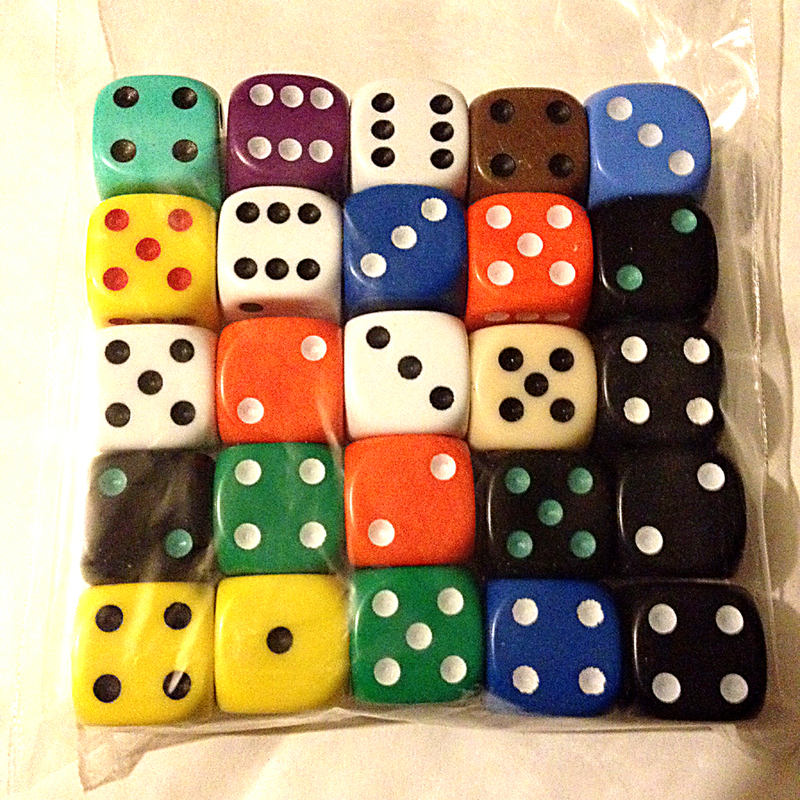 We've had restocks of a wide range of opaque poly dice, now available in the 'Individual Dice' section. There are only a few colour / side combos still out of stock. Hopefully we will fill the gaps very soon. NEW COLOURS in our awesome Ancient Poly Dice set range - now in 10 colours: new Matt Colour Range as well as the original bone, red, yellow and green. These dice really have an antique look and feel to them, great with a skull dice bag for optimum effect on the games table! NEW lines in our Elemental range - the blended colours are now available in a range of peurples, blues, coppers and a few other excellent mixes. Check them out now. 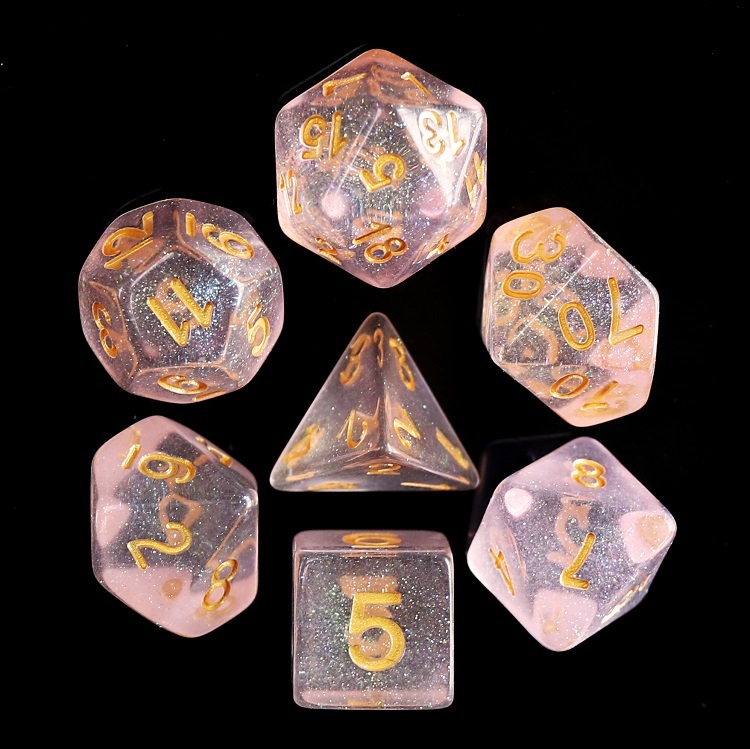 We've also been able to reduce the price a little on some dice, due to changes in the Exchange Rate. 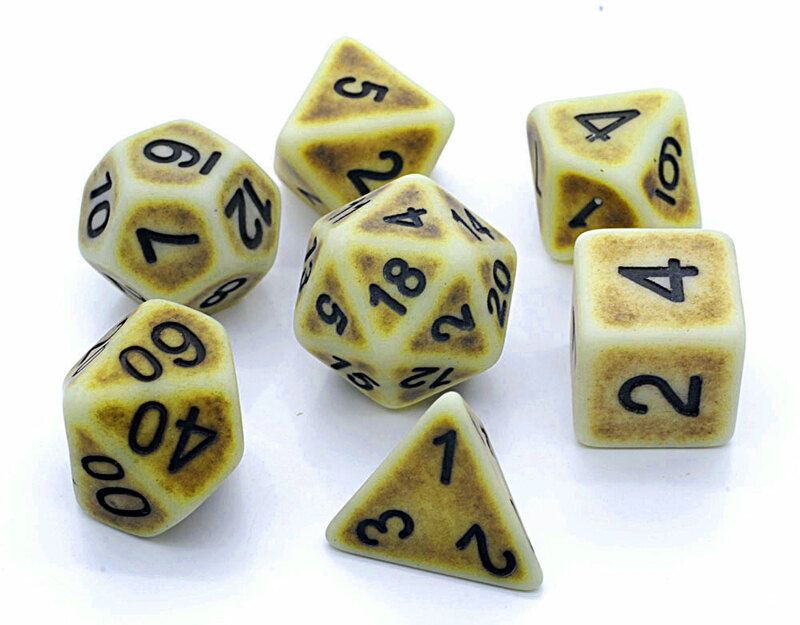 We've restocked our awesome Ancient Poly DIce sets - now in 4 colours, bone, red, yellow and green. These dice really have an antique look and feel to them, great with a skull dice bag for optimum effect on the games table! We are pleased to have RAINBOW poly sets in stock NOW. 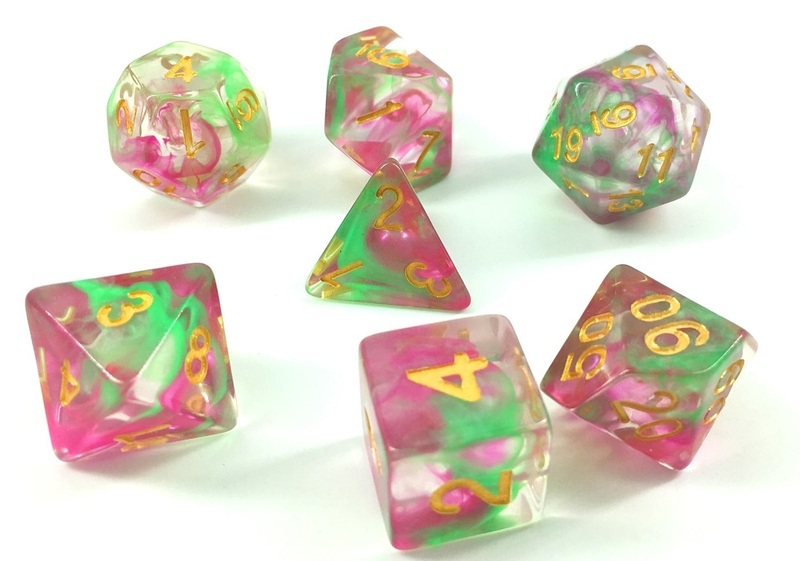 These awesome transluscent multi-coloured dice come in a standard size, and you get the normal 7 dice for roleplaying. Enjoy your multi-coloured gaming, and lets hope you find plenty of gold at the end of these rainbows! 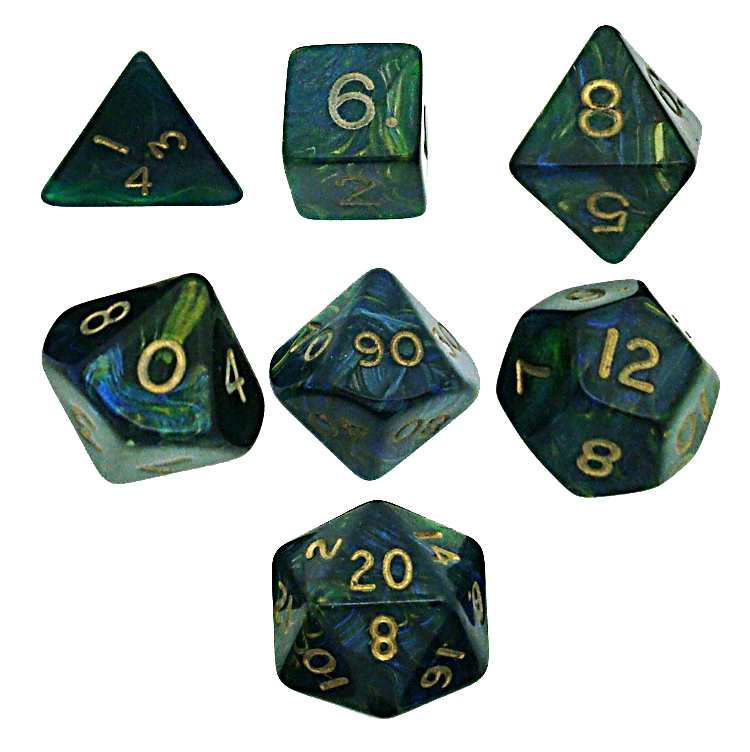 Marble Poly Dice Sets: we have some of the lowest prices onthe internet for standard sized marble RPG dice. 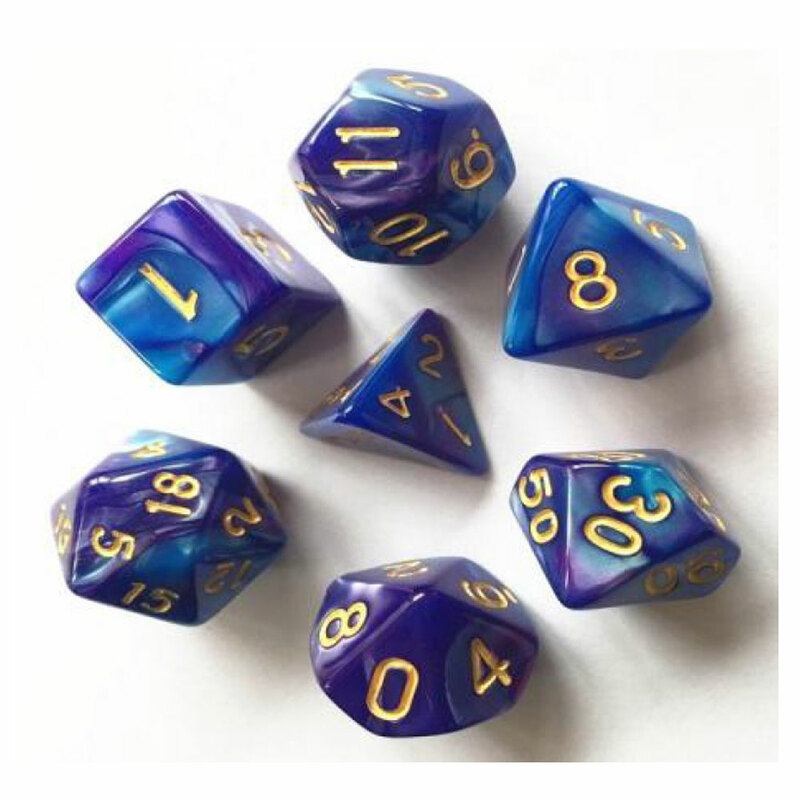 £2.40 per 7 dice poly set, 5 colours available, Blue, Black, Red, Purple and Green, all swiled with a white base and finished in gold numbers. Why not add a cool dice bag too? 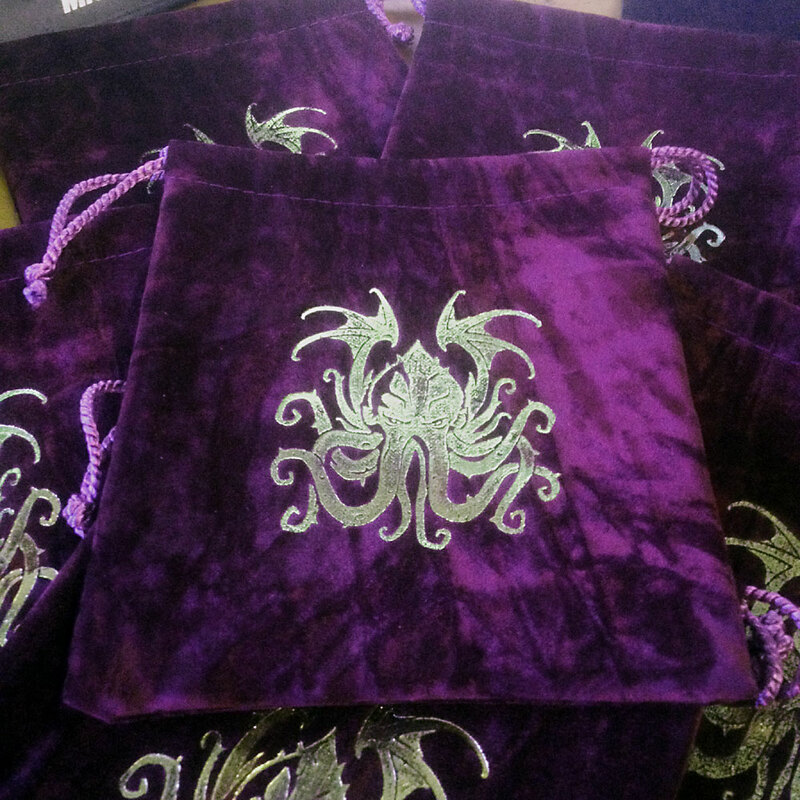 Our next Dice Bag design will feature a Sad Cat with a Squid nailed to its face - yes, you guessed right, roll for SAN LOSS becasue everyones favourite Elder God will be making his way onto our new Purple crushed-velvet dice bags. AAARRRRGGGGGHHHHHH!